There is much to admire in Eastern Interconnection Planning Collaborative (EIPC) the consortium of over two dozen electric system planning authorities from thirty-nine US states and two provinces in Eastern Canada that make up the Eastern Interconnect, the giant power grid that covers this vast part of North America. But scenario planning at least what we have seen to date in the EIPC phase 1 effort is nothing to write home about. EIPC’s purpose is to focus stakeholder attention on a “bottom-up” assessment of the issues facing the power grid including the grid expansion. The EIPC planning process is led by a 29-member Stakeholder Steering Committee (SSC). The SSC chose the three scenarios for use in assessing issues in Phase 2 from among eight resource options studied. More than 72 sensitivity runs were used to assist the SSC refine the three scenarios. EIPC SCENARIO 1: Nationally Implemented Federal Carbon Constraint with Increased EE/DR. This scenario does not use the term cap and trade but it represents similar reduction in carbon emissions by 50% from 2005 levels in 2030 and 80% in 2050 driven by a Federally-set CO2 price. In addition to meeting the 30% of the nation’s electricity requirements from renewable resources by 2030 from scenario 2. This is the all you can eat scenario for green energy appetites. This scenario includes substantial energy efficiency, demand response, distributed generation, smart grid and other low-carbon technologies where the costs for EE and DR are subsidized by the CO2 revenues. This scenario incorporates a progressively larger CO2 price adjusting annually so that the pain increases until the goal of 42% reductions in CO2 emissions by 2030 is achieved. The scenario assumes the CO2 prices are flat after 2030 because electricity demand has been reduced. This scenario requires the most expansive transmission build-out of the three scenarios, enough to accommodate the transmission needs under Scenario 2, the nationally-implemented RPS. That new transmission is described as including ‘hardened inter-regional transmission build-out with a transfer capacity of 37,000 MW—an enormous inter-regional transfer expansion. However, the sensitivities run by the planning team found that even this level of transmission capacity expansion was not sufficient even with high CO2 prices to distribute the renewable energy capacity imagined in the scenario, with appropriate natural gas combined cycle generation back-up. This scenario assumes a regionally-implemented RPS to serve 30% of each region’s load in 2030 with renewable resources. The Scenario assumes utilities will purchase renewable energy credits from other entities to make their targets from qualified renewable facilities including wind, solar, geothermal, biomass, landfill gas, fuel cell using renewable fuels, wave energy and hydropower. This scenario assumes the need for ‘moderate transmission expansion’. 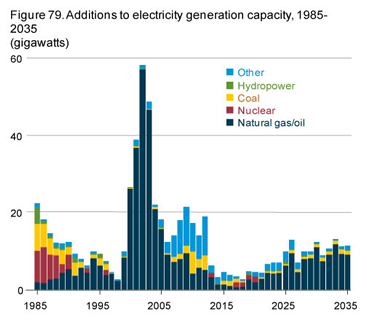 This scenarios is a combination of Future 6 from the planning analysis which has significant supply diversity with coal, gas, wind, nuclear, hydro, offshore wind and other renewables including substantial offshore wind and Future 3 (state and regionally-implemented carbon constraint future) with significant coal retirements. This scenario has 3,100MW of total transmission capacity much less than scenario 1. This Business As Usual (BAU) has no new federal, state or regional energy or environmental policy or program changes. As the current state of policy this is essentially the base case with scenarios 1 and 2 forming bookends for a full range of options consideration. Currently proposed EPA regulations including the Transport Rule, Utility MACT Rule, Utility NSPS Rule, Coal Combustion Residuals Rule, and Cooling Water Intake Structures Rule are assumed to be implemented. Fuel prices remain stable and there are no major technological advances. Inter-regional transmission transfers are not expanded beyond current projects. The scenario involves significant coal plant retirements and new generation construction of renewables and natural gas combined cycle that would require new transmission to assure system reliability. Scenario analysis is a powerful tool for managing uncertainty. By giving permission to think outside the conventional wisdom about future events, scenario analysis allows and encouraging consideration of equally plausible alternative futures. The best scenarios are those that separate themselves from other scenario stories and timelines. If there is too much overlap the scenarios all run together and the ability to test alternative strategies, investments, portfolio risks and technologies is diminished. A reading of the EIPC process in phase 1 reveals the core problem with the approach used and why it is unlikely to result in the best outcomes. The bottom line is these are not really scenarios at all, they are sensitivities off the base case. Business as usual can lead to only two politically correct conclusions: we need more renewable energy so we can reduce coal and thus emissions; or we need a carbon tax to raise the price of coal so that renewable energy can be sustainably competitiveness, demand will be reduced and thus emissions will go down. If that is all there is to this exercise then a lot of companies are wasting a lot of time and money. Perhaps the problem is US DOE is paying for much of this work and is not interested in hearing what the industry REALLY thinks about the energy and environmental future. Perhaps the stakeholders doing this planning analysis are too invested in the current strategies to consider alternatives. Perhaps, the utilities making this exercise possible are worried about irritating their regulators by offering contrarian views to the political correctness on display. Long slow economic recovery means weak demand growth, return to historic average demand growth of 1-2% per year by mid scenario. No cap and trade and carbon offset trading schemes falter. Smart meter installation reaches saturation point but customer benefits are few. Utilities look for earnings growth in reduced operating costs and improved productivity. Push back on dynamic pricing in a weak economy means the best we can do is modestly tiered pricing for electricity—not enough to stimulate demand response. Regulators facing growing rate increase pressure from cumulative costs of new emissions regulations, above market renewable energy projects approved, and the need to assure reliability as coal plants retire. Regulators feel political pressure on rising rates and cut back rate relief requests. RPS stalls as states ‘declare victory’ at 20% RPS goals. Renewable project growth stalls except for rooftop solar. 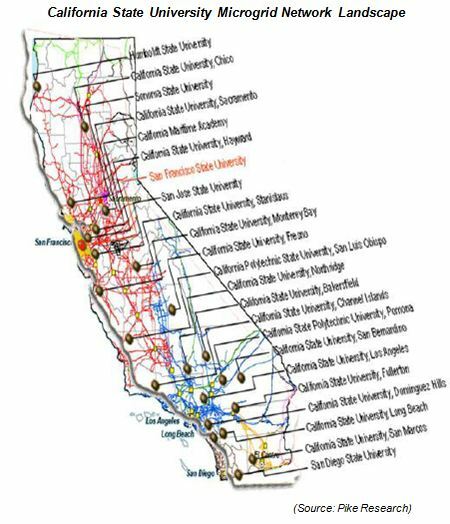 NIMBY stalls most new transmission development in the states. Retiring coal plants replaced by natural gas combined cycle. Growth in unconventional oil and gas development in the US jumps starts the economy. 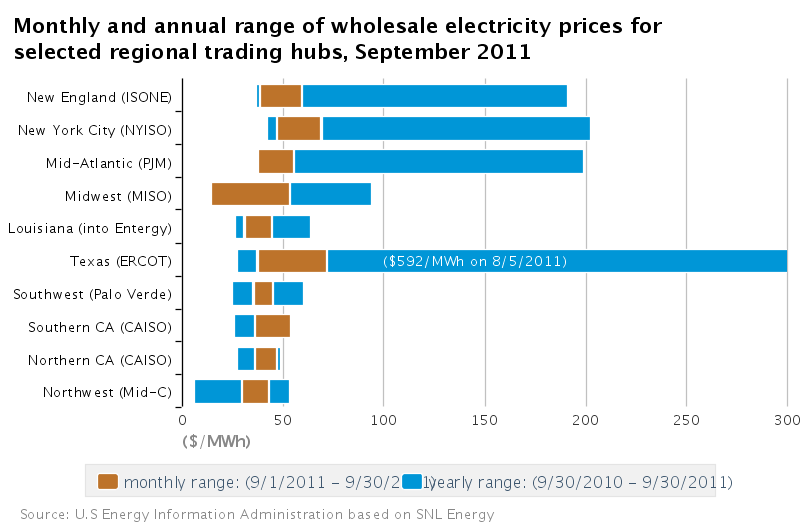 Low natural gas prices undermine the economics for coal and nuclear baseload power. US EPA regulations against coal emissions results in substitution of natural gas for up to 83GW of coal plants. Low cost natural gas fuels a clean energy industrial rebirth making the US a magnet for new manufacturing. Demand for natural gas grows as fuel demand for power generation increases to replace retiring coal, back up new renewable energy and fuel combined heat and power and microgrid industrial development drives an emerging distributed energy future. Demand for new natural gas pipelines, high voltage electric transmission and refining grows. 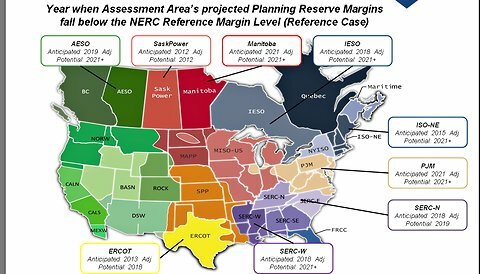 FERC authority over electric transmission clarified by Congress to match natural gas to encourage economic growth. Industrial innovation drives the clean energy future with low cost fuel, easy access to transmission and distribution and new markets for clean energy technologies. Smart meter saturation and meter data access to third party vendors attracts customer aggregators to expand their market beyond just commercial and industrial customers. FERC drives growing market for energy efficiency and demand response with new tariffs that leverage expanding transmission build to support renewable energy access. The combination of smart meters and data, transmission access and OT/IT convergence create new customer aggregation driven energy management products and services. Consolidation accelerates as big players see market potential for EE/DR and energy management integrated into merchant energy driven portfolios. Integrated resource planning is revived by state regulators to restore balance between demand and supply options in utility portfolios as RPS targets are met and subsidies reduced or eliminated in favor of ‘least cost, best fit’ options. The growing potential for DR and EE breathes new life into energy storage technologies. Low natural gas prices and new EPA and state regulations force retirement and replacement of older coal fired power plants, once through cooling water plants, and first generation inefficient wind and solar units. Turns out, utilities like the DER evolution, because it speeds distribution automation and extracts more benefits from smart grid investment and creates a new market for utility owned EE, DR and supply options to fill the gaps thus improving earnings. 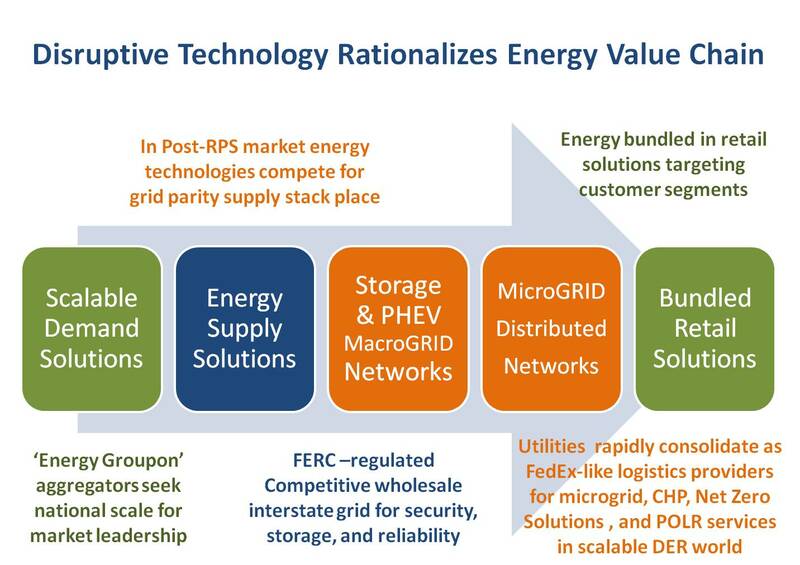 Regulators see the benefits of utility focus on grid reliability, security and modular grid management and adopt rate structures that fund transformation to a DER future upon approval of the integrated resource plan. This scenario results in less new transmission build to serve large remote power plants and a transformation of the grid into a modular, more secure, infrastructure plan. Let’s hope Phase 2 of the EIPC effort can move beyond political correctness and do some really imaginative thinking about our energy future worth the tax money we are going to spend on it. Pingback: Is California’s Resource Adequacy at Risk? « Zap! Crackle! Pop! Pingback: The Seeds of the Next Power Boom were Sown in the Last Bust « Zap! Crackle! Pop!